In this tutorial, we are going to see about how to integrate payment gateway in PHP via Paypal. We are going to see an example code in PHP for payment integration. In this example, we are using Paypal sandbox (test) mode to check payment flow before going live. index.php – Containing a form with Paypal payment parameters and Buy now button. cancel.php – Acknowledge user if the payment is canceled. This form contains item_name, item_number, amount, currency and more parameters with Buy now button. We need to copy the Paypal button code from My Account -> Profile -> My selling tools -> PayPal buttons. After clicking this button, the params are sent to Paypal sandbox as mentioned in the form action. In this example, we are having payment.php as IPN listener to receive payment notification. 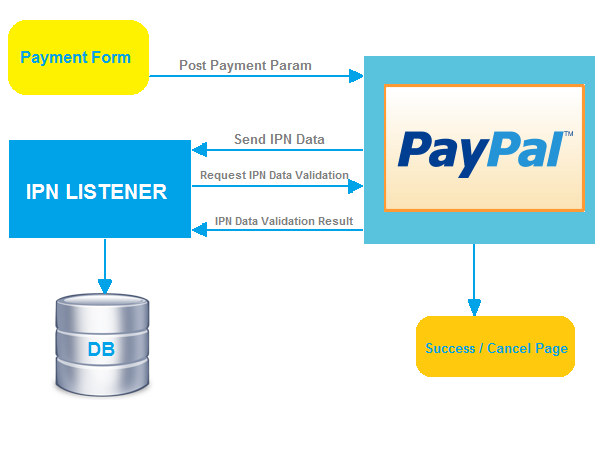 Paypal provides the IPN listener code samples for various languages. We have used paypal_ipn.php and make changes to update Payment database.